In September 1998, England began their quest to qualify for the Euro 2000 finals in Belgium and the Netherlands with the memories of the 1998 World Cup still fresh in the memory. Despite the heartbreak of the Argentina game, there were reasons to be optimistic about Glenn Hoddle’s side with a strong blend of youth and experience and the manager’s belief in an attractive style of play. Unfortunately for Hoddle, his other – far more controversial – beliefs would soon spell the end for his time at the helm. The Euro 2000 qualifying draw in January 1998 had paired England with Bulgaria, Luxembourg, Poland and Sweden. Minnows Luxembourg were always going to be whipping boys, so it was effectively a four-way fight for the top two spots – the winner going through automatically, the runner-up into the play-offs. It wasn’t easy looking but Hoddle’s side would be favourites. Sweden had failed to qualify for the last two major tournaments; Bulgaria had been present at the last three of them and reached the semi-finals at the 1994 World Cup, but their poor performances in the 1998 finals suggested the good times may be over; and although memories of that fateful night at Wembley in 1973 persisted, Poland had not qualified for anything since the 1986 World Cup. Excluding Euro ’96 – when they qualified automatically as hosts – England had now been paired with the Poles every qualifying campaign since Italia ’90. It seemed almost inevitable they would be drawn together. “We certainly know our way to Poland,” said Hoddle as he reflected on England being in a group which The Guardian felt was the “short straw” due to the number of tough opponents. When Alan Shearer scored from a free-kick a minute into England’s opening qualifier in Stockholm in September 1998, it was hard to imagine the sheer struggle that lay ahead over the next 15 months. But by half-time it was pretty clear of how things would pan out as Sweden came from behind to lead 2-1. They held out for the remainder of the match as England started with an ominous defeat. Hoddle’s side were without the suspended David Beckham, who had become only the fifth England player ever to be sent-off against Argentina in the World Cup. The match against the Swedes saw Paul Ince become the sixth, with it being far from the last show of indiscipline from the side during the campaign. 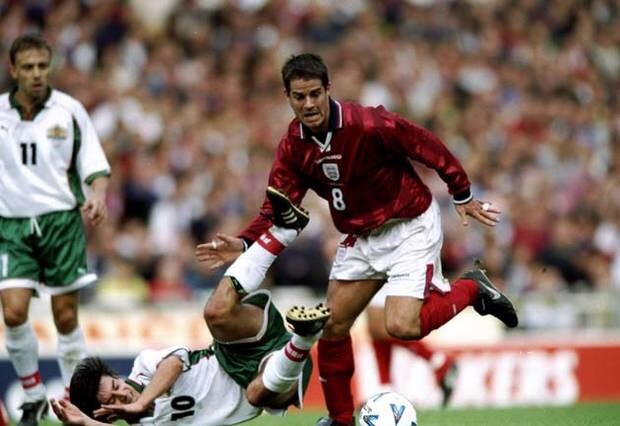 Jamie Redknapp in action during England’s tedious 0-0 draw with Bulgaria. This qualifying campaign marked the start of the regular international double headers we are now used to and in October England played two matches in five days. They did little to boost Hoddle’s reputation, coming after the controversial publication of his My 1998 World Cup Story book had left some players unhappy at dressing room secrets being revealed. At Wembley against Bulgaria – who had lost 3-0 to Poland the previous month – England were far from impressive. They were held to a sterile 0-0 draw that attracted much criticism. Things looked like they were about to get a whole lot more embarrassing away to Luxembourg when England’s part-time opponents were awarded a penalty five minutes in. Dany Theis squandered the chance by firing well over the bar, bizarrely prompting Channel 5 commentator Jonathan Pearce to excitedly react almost as though a major football nation had missed a crucial last minute penalty against England. Hoddle’s side eventually won 3-0 with Owen, Shearer and Gareth Southgate all scoring. But there were few cheers for the win, as there remained a sense of a World Cup hangover lingering in the air. Hoddle angrily dismissed tabloid speculation of a dressing room mutiny, but it was clear all was not well after a mediocre start to the qualifying campaign. 1998 ended with a 2-0 friendly win over the Czech Republic at Wembley, in what would turn out to be the end of the line for Hoddle. As England prepared to face world champions France the following February in another friendly, Hoddle’s contentious views expressed in an article in The Times about the disabled and reincarnation would cost him his job. It was a messy end to his reign and former Leeds United manager Howard Wilkinson took temporary charge for the France match, which saw Arsenal’s Lee Dixon make a one-off international return after more than five years and England beaten 2-0. Before England played their next qualifier in late March against Poland, they had a new boss. Kevin Keegan, the man England so often turned to for on-field inspiration in the late 1970s and early 1980s, was now tasked with helping leading the team towards the Euro finals. He had won managerial plaudits for the free-flowing football his Newcastle United side had played a few years earlier, although major honours had eluded him after the Premier League title slipped through their grasp in 1996. Keegan made clear he was only taking charge for four games as a job share with his role at Fulham, adding his wish to see a “1,000% effort” in those games. All smiles after Kevin Keegan’s first match in charge of England produces a 3-1 win over Poland, with Paul Scholes scoring a hat-trick. He got the right response in his first match, Paul Scholes scoring three times against Poland in a 3-1 win at Wembley to boost their qualification hopes. All seemed well with the world and Keegan duly left Fulham and took the role on a permanent basis, but doubts were setting in again. After a 1-1 friendly draw in Hungary in which Wes Brown, Jamie Carragher, Michael Gray, Emile Heskey and Kevin Phillips made their England debuts, the qualifiers resumed in June and alarm bells started ringing. 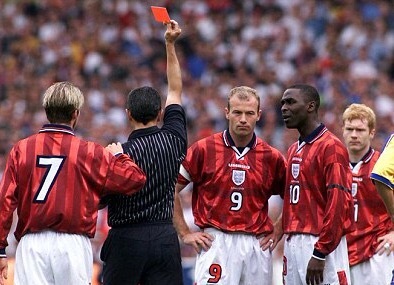 Scholes became the first England player to be sent-off at Wembley in a frustrating 0-0 draw with Sweden. Although England had ended their opponents’ 100% record, the result meant the best Keegan’s men could now realistically hope for was second place in the group. Four days later there followed more disappointment with an underwhelming 1-1 draw in Bulgaria, leaving them still with much to do to make the finals. ‘The honeymoon is over after the first kiss” screamed the headlines, with Keegan’s ‘Messiah’ status having proved short-lived. Summing up the qualifying campaign: Paul Scholes sees red at home to Sweden. The group had a strong echo of the qualifying process a decade earlier for Italia ’90, with Sweden in front, England at risk in second spot and the Poles the only other side capable of finishing above them. It came as no surprise that England beat Luxembourg 6-0 at Wembley in early September, with Shearer scoring a hat-trick. But it was the match four days later in Poland that really mattered. If England won they would definitely finish second; if Poland won they would be runners-up and England would be out. It was if it ended in a draw that things became complicated, as Poland would then need a result in their final match in Sweden to edge out England. Keegan’s side seemed torn between going for the win to seal a play-off place and a draw to at least give them a chance. The goalless match summed up England’s qualifying campaign, as David Batty was red carded and the team struggled to stamp their authority on the game. Indeed, they could easily have lost and been definitely out of the running. England had failed to qualify for the next World Cup after being semi-finalists in 1990 and it looked like history would repeat itself after coming so close to winning Euro ’96. They still had a chance, but it was out of their hands. England now had a month to wait and hope Sweden could do them a favour. Although there was little doubt the Swedes were a better team than Poland and had a near-perfect qualifying record, they were already through and could potentially take their foot off the pedal whereas the Poles needed a result and that extra desire could see them achieve it. But, as with Switzerland digging them out of a hole in the 1982 World Cup qualifying campaign and – for a few days at least – when Israel beat Russia in the Euro 2008 qualifiers, England were thrown a lifeline they hadn’t really merited. Two goals in the final half hour gave Sweden a 2-0 win and the feeling across England was one of sheer relief. The following day’s friendly against Belgium at the Stadium of Light was not the wake many had anticipated, with a renewed sense of optimism in the air. Jamie Redknapp scored a cracking goal in the 2-1 win, as cousin Frank Lampard made his international debut. Paul Scholes helps England to a 2-0 win at Hampden Park. After a month of build-up, the talking could finally end on November 13 at 2pm at Hampden Park. 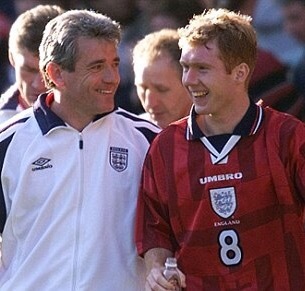 Scholes scored twice in the first half as England won 2-0, with Keegan declaring his side “played fantastic today”. Although many would have disputed that version of events, given England rode their luck a bit during the afternoon, there was no question they looked odds on to go through. The second leg was played four days later, marking Scotland’s final visit to the old Wembley. What should have been a comfortable passage into the finals turned into a night of tension for England and it could have been even worse. Don Hutchinson’s 39th minute goal gave Scotland the lead on the night and if either side looked like scoring again, it was the Scots as England failed to muster a shot on target. David Seaman had to deny Christian Dailly from levelling the aggregate scores late on, as Scotland went in search of extra-time. They never got it, with it not being quite clear who was comforting who as Keegan and Brown hugged at the end. England were through but it was Scotland who could leave the field to greater cheers from their fans after winning on the night. “Maybe it was too much for the players psychologically having a 2-0 lead,” admitted a baffled Keegan afterwards, as he again learnt about international management the hard way. But at least England had progressed, something that had looked unlikely after the match in Poland two months earlier. For the Scots, the play-off exit marked the beginning of a long absence from major tournaments – which they are looking to finally end by making it to Euro 2016. Keegan’s men had staggered into the Euro 2000 finals with a very unconvincing record. They had managed just four victories in their 10 qualifying matches, two of them coming against minnows Luxembourg. After all the excitement of Euro ’96 and France ’98, this had been a serious wake-up call. The finals in the Low Countries would expose England’s inadequacies – and the tactical shortcomings of Keegan – as they crashed out in the group stage.